U.S. stocks closed in modest gains, as market participants welcomed the earnings reports and the measured tone from the Federal Reserve Chairman Jerome Powell during his two-day congressional testimony. The upbeat outlook for the economy from Fed's Beige Book also provided support for markets. Dow closed up 79.54 points, or 0.3%, marking its 5th consecutive day advance. 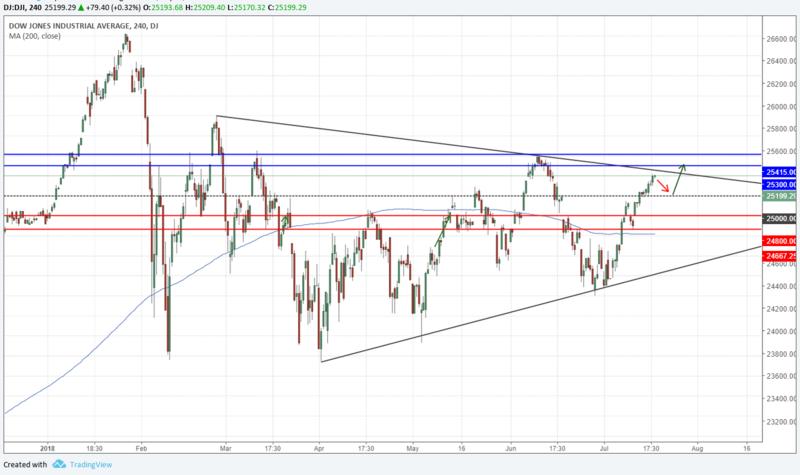 The Dow Jones Index closed at 25199 level trading around a major resistance. More upside is likely once price breaks above this triangle pattern. A bullish breakout above the resistance trend line at 25300 would confirm a potential uptrend continuation and possibly establish new quarter highs. On the flip side, if the index fails to break the trendline it would form a lower high and pullback towards 24800.